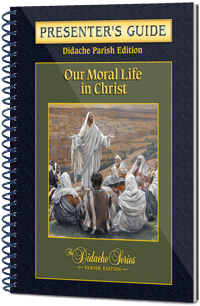 The Our Moral Life in Christ, Presenter’s Guide is designed to help the presenter or catechist deliver effective lessons, while engaging students in discussions and activities. Derived from the popular Didache Semester Series, the Didache Parish Series has been adapted for parish theology and home study programs. Presented in an easy and accessible format, the eight book series provides a thorough overview of the Catholic Faith. This series is also helpful for individuals seeking to deepen their knowledge of the Faith. The Didache Parish Series textbooks are created in accordance with the USCCB Curriculum Framework for Parish and Youth Ministry Programs and published with ecclesiastical approval from the Archdiocese of Chicago.